« Are 2015 E-Commerce Sales Slowing? 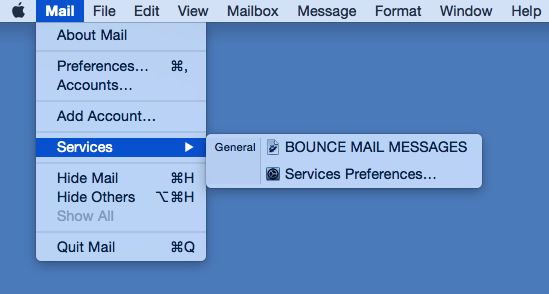 Up until somewhat recently, Mac OS X mail.app had the handy feature of being able to manually bounce email. Technically, the mail bounces with a new header created, but still. Here are the Mail.app email bounce instructions from Lechnyr. Run the Automator program, located in your /Applications folder. When prompted to choose a type for your document, select Service and click the Choose button. You’ll now have a window that you can drag and drop various actions in to. Using the drop down menus at the top, make certain to indicate that the service receives no input in the Mail application. Drag Get Selected Mail Items into the workflow window. Next, drag Run AppleScript into the workflow window. Enter in some code (below) and save the workflow with a meaningful name such as, Bounce Message. Here’s the AppleScript to copy and paste into the Automator workflow. After you’ve saved the workflow, you’ll see this in your Mail.app menu. And yes, it does work in OS X Yosemite. This entry was posted on Friday, November 20th, 2015 at 9:36 pm	and is filed under Tech, Email Marketing. You can follow any responses to this entry through the RSS 2.0 feed. You can skip to the end and leave a response. Pinging is currently not allowed. Does NOT work in El Capitan’s Mail program. Applescript runs without error messages, but emails do not get bounced (or reliably deleted even!). Rats! Ack, I haven’t tested the script in El Capitan (still have Yosemite) but…I can tell you what I see when using it. 1) The “bounce” isn’t real per se as what it does is create a new set of headers for the send back rather than a distinct Delivery Status Notification (DSN code) or bounce code, but it’s good enough for some email systems to see it as a bounce. Hi and thanks ofr this great tip. I followed the instructions and altough I thought it worked all that happens is it deletes the selected message and transfers it to my trash bin. There is no “bounce” message sent to the originating email address selected. I copied the code exactly as you advised and deleted everything else in the script apart from what you have quoted.